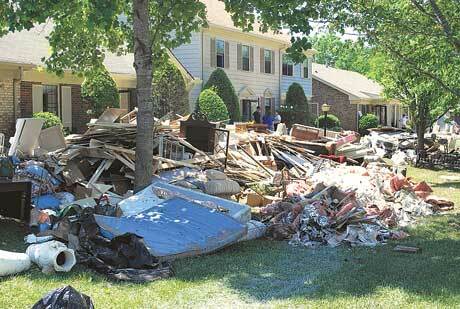 NASHVILLE, Tenn. ““ Ruth Klar and Alicia Safdie knew they were lucky, safe, and healthy amid the flood’s muddy wreckage. But the little things made them cry. “My cookbooks are gone,” Klar said in her den at River Plantation, a large townhouse condominium community in Bellevue, one of the areas of Nashville hardest hit by the May 1-2 floods. Stains on the wall marked the three and a half feet the floodwaters reached, taking the cookbooks full of favorite Jewish recipes. A few hundred yards away at Safdie’s home, she and Eva Watler took a break from clean-up. “I used to baby-sit her in this house,” said Watler, tearing up. A few days earlier, Safdie had broken into tears when she realized she had no shoes; they were gone with the flood. Now she was sounding an optimistic note. “We’re gonna be OK,” said Safdie, who was rescued, along with her mother and two guests, by boat. Just a few days after the rains finally quit, River Plantation offered up an eerie landscape. All types of vehicles lined the streets – visitors’ cars, workers’ trucks, church vans, and dirt-crusted cars rendered useless by the flood. Countless grayish mounds of dusty-smelling debris – sodden drywall, insulation, ruined tables, chairs, couches, books, toys, you name it – took over what used to be grassy front yards. The small enclosed patios on the back side of the condos looked much the same. Rose had gone door to door at River Plantation the day before, just talking to residents, Jewish or not. Rose’s visit was just one example of the Jewish community responding to the flooding. Jewish Nashville quickly joined together to rebuild waterlogged homes and resettle uprooted families after more than 13 inches of rain pounded Middle Tennessee over two wearying weekend days. The Jewish community began mobilizing its post-flood relief efforts when Harry Baker, the sports and fitness director at the Gordon Jewish Community Center, fielded a phone call just as rains began slackening a bit. A nearby Red Cross shelter was overflowing, and 140 people needed a place to stay. “Without hesitation we said, ‘Get them over here,'” Baker said. Five minutes later, the Red Cross arrived and workers readied the JCC gym and auditorium. In the end, more than 500 individuals slept in the gymnasium on cots provided by the Red Cross. They also were served three meals a day, thanks to the generosity of local restaurants. In addition to providing shelter to displaced individuals, the JCC operated a relief distribution center for several days, allowing flood victims to come and take items of need, such as food, clothes, toys, books, toiletries, cleaning supplies, and much more. It provided hundreds of individuals with items they needed to begin rebuilding. Volunteers associated with the JCC staffed the relief center around the clock. “The place looked like Macy’s – it was filled,” said the JCC’s executive director, Eric Goldstein, who had been out of town when the flooding first hit. Baker guided the first flood-relief efforts. Initial help has reached Nashville quickly, from volunteers and donors. Jewish federations were quick to send food and donations. Day schools and preschools are collecting money, as are federations and congregations nationwide. Congregations outside Nashville also may send members volunteering to help, said Steve Edelstein, executive director of the Jewish Federation of Nashville. Nashville resident Fred Zimmerman, chair of the national emergency services committee of the Jewish Federations of North America, said the disaster relief process encompasses three parts: immediate rescue work, resettlement, and efforts to boost emotional resilience. “This is a long-term process,” he said. The JFNA provided the local Jewish community with consultation, communications, and fund-raising assistance. The community’s rabbis visited flood victims; three spent time at the Safdie home. On one visit, Sherith Israel Rabbi Saul Strosberg and another community member pulled up Klar’s soaked carpeting. The Safdies’ story began at about 9 a.m. on a Sunday when rain crept into the first floor of their home. At first there were jokes about how they always wanted to replace the carpeting anyway, but the wisecracks soon stopped. In two hours, four and a half feet of water inundated the first floor. Alicia Safdie, her mother, Suzi Safdie, and her visiting cousin and his girlfriend went upstairs and stayed there until someone in a small boat rescued them that afternoon. “We each packed a little bag,” hers with two favorite stuffed animals and two external hard drives from her computer, Alicia said. They then climbed out the second-story window and down the side of the house, hanging onto woodwork, and into the boat. By that time the water outside was perhaps six feet high. Broken glass in a large downstairs window marks where the boat hit the house, and dark scuffs on the siding show where the four climbed down. They threaded their way through newly formed “canals” between the subdivision buildings. (“We’re bumping into buildings in the boat,” Alicia said.) Once they reached safety in an unflooded part of the subdivision, Alicia’s uncle picked them up and took them in. She’s been keeping friends updated on Facebook. Nearby, Ruth Klar talked with friends on her cell phone. She had lived in her house since 1986, when that section of River Plantation was first built and when her late husband, Stanley, retired. “He wanted to put the key in the door and walk away,” she said. Klar was able to salvage many family keepsakes – wedding photos, original pastel artwork of her three sons as bar mitzvahs, framed immigration documents from two or three generations ago. A mezuzah remained affixed to a doorjamb, and her mother’s antique mirror was untouched. The floodwaters stopped just short of a stenciled family tree that Klar had painted on her kitchen wall. But everything below the water line was pretty much destroyed. “My freezer out in the storage shed was turned upside down,” she said. Inside were 260 pounds of kosher meat. And she won’t be able to use the now-soggy boxes of matzoh she had put aside to make toffee brittle. Still, she and her son, Arthur, in from Knoxville, slogged through the next steps: a tetanus shot for him, FEMA aid applications for her. The Safdies followed similar post-flood steps, with Suzi away from home to complete FEMA paperwork. The Nashville federation has set up a mailbox on its Web site, www.jewishnashville.org, for flood relief donations.